As I continue to lose weight, I think back to where I was 5 years ago and remember that I'm about 100 pounds lighter than that Scott was. Losing another 50 pounds doesn't seem too bad (though it won't be easy!). I'm almost 3 weeks ahead of schedule for my Lose It or Lose It challenge. Not too shabby, sadly, getting ahead doesn't really help with Lose it or Lose It because I still have to lose another 3 pounds this week (and it just so happens to be Thanksgiving!). I'm pretty sure I can knock off a few pounds this week, even with Turkey day. I'll be going to the gym tomorrow, perhaps Wednesday morning, and definitely Saturday and Sunday so it should be too much of a bother. It is Monday, and you know what that means! I subject myself to the terror of posting my weight on the Internet for all to see. When we last left Scott he was rocking the scales at 322, not a good weight. What will the scale have to say today? Well, you already know it said 312, which means I've shed 10 pounds! Hurrah! It is very funny what working out + eating right will do for you (truth be told I'm doing the first phase of the South Beach diet in order to kickstart the weight shedding, but it still counts darn it!). 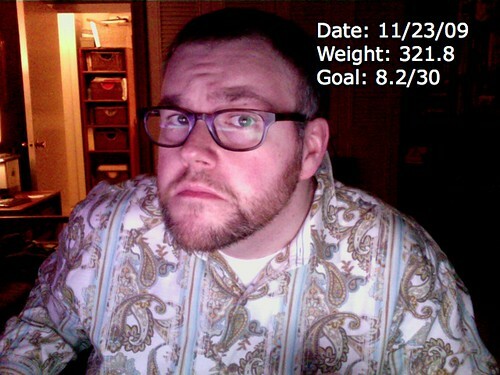 Part of me getting fit again is posting my weight here, on the blog, every week. I'll weigh myself every Monday and post it to the blog that evening. While this is a little embarrassing at the moment (I had pledged to myself that I would never be over 300 pounds again... but hey donuts happen!) I know that this really helped in the first time I decided I needed to shed some pounds. I'll be using the wonderful Weightbot iPhone app to track my weight (because I'm a dork), which is where the lovely graphic for this post comes from. It can only go down from here! Woah, it has been awhile since I've posted a Scott Gets Fit entry since December 12th, 2007! Interestingly, that's around the same time I started going out with Marisa. Mere coincidence? I think not! Anyway, I'm back on the bandwagon and I weighed myself yesterday: 282.6 pounds, which is so close to my low of 281.1 (taking into account I stopped going to the gym and ate whatever the heck I wanted for the last few months this is good. I was probably about 297 a month ago. Hurrah for the gym!). Stay tuned for more Scott Gets Fits posts, because darn it losing weight is fun!